I'm back with another product spotlight! About a month ago, I brought Jan Marini's Body Block sunscreen with me on my 4th of July trip to Savannah. I've been pretty careful with my skin these days and that includes protecting my entire body from sun damage. I already love Jan Marini's Face Protectant, see review here, so I wanted to see how the body version held up. 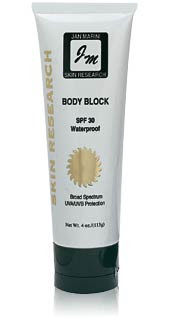 Jan Marini's Body Block SPF30 is a waterproof, broad sprectrum sunscreen. Over time, this product is meant to prevent skin aging from sun exposure. First off, you saw my last review on the Bioglycolic Resurfacing body scrub. The Body Block is meant to be used right after. The scrub preps the skin. Like many sunscreens, you're supposed to apply this prior to sun exposure. I smoothed some on in my hotel room before I hit the pool and beach. The first thing I noticed was the yummy scent - mmm citrus, sugar and coconuts. Also, this sunscreen applies super smooth! Most sunscreens are really thick, leaving white streaks that require extra rubbing in. The Body Block melted right into my skin, cutting the application time in half. I wore this to the beach and pool and experienced no redness or irritation. This contains SPF30, so it still allowed me to become nice and bronzey without turning bright red. Throughout the day I would reapply this to make sure I stayed protected. -I wish the bottle was jumbo size! This product is definitely staying in my beach bag. I've never had a body sunscreen that blended so well into my skin before - it's a keeper! Giveaway Alert Giveaway Alert Giveaway Alert Giveaway Alert !!! Jan Marini is giving one of you lovely ladies/gents a complimentary Body Block SPF30! Just in time to use to catch the last rays of the summer and continue protecting you all year round. Just leave a comment telling me why you want to win and I'll announce a winner tomorrow. Good luck! I actually want to win this for my friend and not myself. My friend, Samantha, was diagnosed with a life threatening cancer. It was skin cancer. She had to get a small chunk out of her face and she has a heart-shaped scar there now. Sam can never tan or be in the sun anymore. She always has to wear sunblock everywhere she goes. I think this would be good for her to try. Plus, we live in Texas and it's soooooo hot here! I would love to win this sunscreen. I am of Irish descent (fair sensitive skin, freckles, auburn hair and green eyes) so anything that can prevent more freckles to appear is good and I am still trying to find a good body sunscreen that doesn't leave me oily considering I never go outside without sun protection. Just a FYI for my face I love Coopertone Nutra-Shield Dual Defense Faces SPF 70 :) it doesn't leave a greasy film on my skin or white residue and I can use it under my makeup everyday. ;) I paid 13$ for mine. Not too bad. Thanks for a chance at trying this product out! I dont' have any Jan Marini products yet, heard a lot of good things. Suncreen is always a great thing to have. Thanks. i would like to win because i am fair skinned and i am always looking for great sun protection products. I would love to win this because since I have been in my teenage years, I have been on the constant look-out for a sunblock that has high protection and yet is wearable enough that it does not irritate or aggravate my sensitive skin. I want to win this sunblock because your review sounds great and I have not found a sunblock that I really like. I tan very easily, and no sunscreen seems to help! So my arms look like a farmers tan! Please help me out! After the tan fades I am left with tons of freckles... I think the sun wants to torture me... haha thanks for the opportunity! Following your blog has really been the reason why i've started to take more care of my skin, because I wasn't before. Im only 24, but it's all about "age prevention" right?! lol Anyways, I've been wanting to try Jan Marini stuff for awhile now because of your reviews....so if i won, that would be awesome!! I'd love to win this because my skin is very sensitive and it really needs sunblock. I don't get tanned, I get burnt. So yeahhh. I would love to win this sunscreen because it seems like so far every sunscreen I have used has clogged my pores. It's such a terrible thing to be testing stuff on your own face to see if it would work because if it doesn't work, you are left with several bumps on the face for a few days/weeks. Basically low end to high end sunscreens I have tried, and each have clogged my pores or caused me to have skin irritation. I'm still looking or the HG and would love to try this in hopes that it will be. Thanks for making this contest. I would love to try this b/c JM products are known to be great. I use the face sunblock and love it. Hey, never too young to go anti-aging. Well basically we all need sunscreen. I'm looking for a new one myself. I can't even go out without it, according to my doctor. So I would love to try this product to see how it compares to another sunscreen I've been eying. Thanks. I would love to win because I have used many types of sunblock; however, it seems most clog my pores and I get all oily. I would love to win this. Last week i had an operation from my nose and i must keep myself from sun. I mean i should protect myself against sun. That would be great if i win this. Thanks for the giveaway. I would love to win this sunscreen because I know Jan Marini makes really quality products. I am outside quite often and I just want to protect my face and keep it looking youthful. I think this would work well for me because it is gentle enough for my sensitive skin and it won't feel so thick and greasy like the other brands I have tried. I currently have Shiseido and it works nicely but it is pretty expensive. I've been reading your blog for a long time but do not comment as much. I want to win this sunscreen because I've never tried high-end sunscreens before. Most of the sunscreens I use are from the drugstore and I have a hard time finding one that does not irritate my skin. I want to win this because I think sunblock is the best arsenal on my skin care regimen. I really like trying different sunscreens and I never leave the house without it. Another thing is the smell of these products that are out there, it smells like im rubbing melted plastic on my body, makes me not even want to go out in the sun, just so that i dont have to smell it. It would truly make me happy and grateful if i got to receive this gift from you and Jan Marini. So i hope you get to enjoy all the comments and find the person who truly will enjoy this, even if it isnt me. Thanks. i am always looking for new sunscreens, I have a couple, but dont like the consistency so i tend to skip it, which is really bad for my skin!! Hopefully this product will change my views on sunscreen! ;D Plus since im in the sun a lot in sunny san diego, CA, i wanna go out to the beach and feel protected! thanks for this giveawayy! I want win because there is no such thing as "black don't crack"! Hello ....load on the SPF people! besides sun damage and aging who wants skin cancer...not moi! I want to win this because I'd like to give this to my brother and sister who both go to college in a very hot and sunny place. I think the sunblock they're using isn't good enough to protect them all day so I'd like to give this to them so they would be better protected. i wear sunblock spf55 on my face everyday! unfortunately i'm not so good with my body. lol. this would be great to help me get a routine going!! Hey ren-ren, it would be nice to have the sunblock because it helps protect against getting wrinkles and prevents from getting cancer. Its important that we take care of our skin now, so that we can prevent from gaining these risks in the future as we age. Thanks for doing this give away ren ren! i want to win because first i had never tried jan marini, so this would be a great way for me to try their products. plus my skin is very sensitive and i have seborrheic dermatitis. unforunately many sunscreens clog and cause to get bumps and they are itchy and they flake. i live in orange county, california. it's so hot where i'm living. it's so hot that my relative had a heat stroke. so using this sunblock will help me. *i have a family history of skin cancer in my dad's side. so i'm very cautious of putting on sunscreen, even if i go to do my errands for a few minutes, i still put on sunscreen. all my life i have never put on sunscreen till i turned 21. i was pretty ignornant and lazy about it, but now i'm very aware of the hazards of the sun and its uv rays on our skin. i see so many cases of these in my hospital where i work at as a student nurse. Sunblocks generally require a bit of time to rub into your skin and they don't smell that nice. I would love to try out this product. Thanks for the giveaway! I've been swimming a lot lately and would love to try out this product especially due to sensitive skin. Ren I love your blog. You were the first makeup blogger that I saw on Youtube. And I loved it. I really need sunblock because honestly I don't want to have wrinkles or get skin cancer.. yeah haha. i would like to win because i think i would actually use this product to my advantage! I have a few sunspots on my face already and its a constant reminder of my need to wear sunblock. I would like to win this product because i think i would benefit from it! I am a bit on the fair side and although I looove looking tan, it is not the best for my skin. Not only can it cause skin cancer but sometimes I peel horribly. From your review it seems to be a great product. Even if I don't win I might still buy it to give it a try! I want to win this sun block because I believe that protecting one's skin from the sun is very important. More people need to be aware that the sun is no joke...it's never too late to start preventing the sun from doing any damage to the skin.